Chocolate and peanut butter. Peanut butter and chocolate. The combination goes oh-so well together but rarely do you get to have them for breakfast! 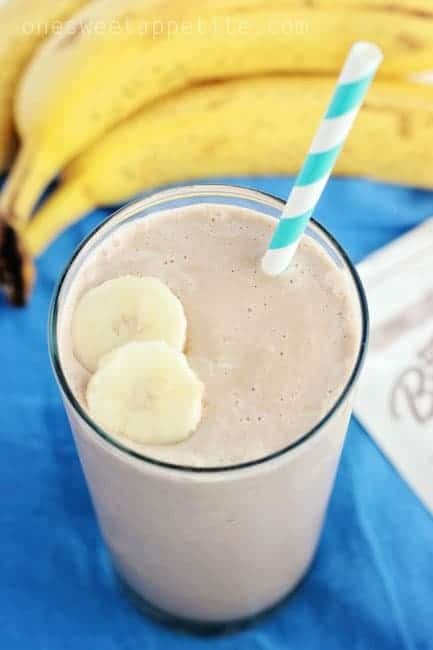 Today, thanks to Carnation Breakfast Essentials, I have a great chocolate peanut butter smoothie that is sure to help kick start your day! I shared a little peek on instagram a few days ago and have been itching to share the goodness with all of you! Before we dig in let’s chat about all of the wonderful facts about Carnation Breakfast Essentials. It’s such an easy solution for busy mornings. Especially if you have kids. I always feel like I’m sneaking something healthy into our diets. No one has a clue that the giant cup of chocolate milk I serve has 21 vitamins & minerals, 13 grams of protein, and loads of calcium. That’s if I decide to serve it the regular ol’ way, but let’s kick things up a notch. 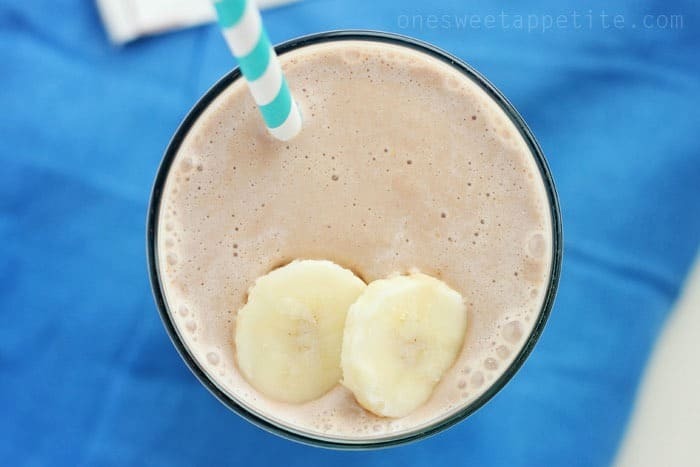 Let’s toss in some peanut butter, milk, ice, and some bananas for a chocolate smoothie that will knock your socks off! Place all of the ingredients into your blender. Blend until smooth and enjoy! My five year old absolutely despises bananas. He can taste these things no matter how well hidden, but for some reason this one has won him over. I gave him a small glass while I shot these photos and was amazed at how quickly he sucked things down. Last time I added a handful of spinach before blending and he had no idea. I love that I can get him to eat his veggies with him none the wiser! We have already been back to Wal-Mart to buy more of the chocolate Carnation AND they even have a $1 off coupon you can use! 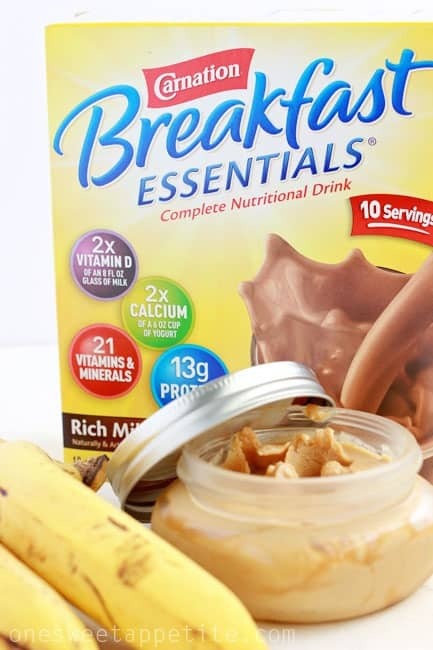 Carnation Breakfast Essentials Powder comes in many flavors, such as Rich Milk Chocolate, Classic French Vanilla, Classic Chocolate Malt, Dark Chocolate, Strawberry Sensation, and the Variety Pack (which has multiple flavors). Which means there are loads of different smoothie options that are just waiting to be made! They have some great options on the recipe portion of their site! Make sure you follow them on Facebook to keep up with all of the Carnation Breakfast Essentials latest! This looks so good. 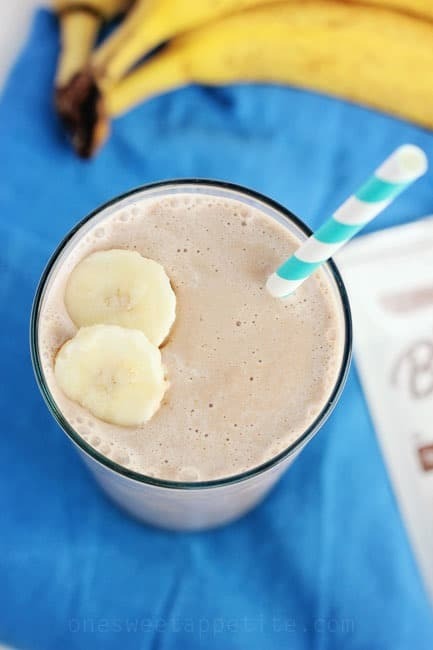 A good idea for mixing up my morning smoothie or to have when I get a chocolate craving at night. I love this idea! Peanut butter and chocolate for breakfast!! I’d die! I’m going to have to pick up some Carnation Instant Breakfast! I love these mixes- they make smoothies so easy! I love breakfast smoothies. And chocolate and peanut butter were just meant to be together. Yum! My kids would be over the moon if we had this for breakfast! They would totally think it was dessert! I’m a sucker for peanut butter. Yum. We buy the Carnation breakfasts sometimes but I never thought to add things to it to make it even healthier! So clever! Thank you for linking up to The Creative Exchange. We hope you will link up again this Thursday! This sounds amazing! I’m totally going to try it this week! Great Idea. Love your page and can’t wait to try this. I have an I’d like to share though. How about the Carnation instant breakfast chocolate no sugar added instead for Diabetics, and instead of Peanut butter, try Soybean butter instead for those who have peanut allergies. pretty sure it would taste just as good! This recipe is so adaptable. I think that’s a great idea!